Soft, deep-blue flowers on a standard stem. This lush patio plant will bring a tropical touch of the exotic to your garden this summer! 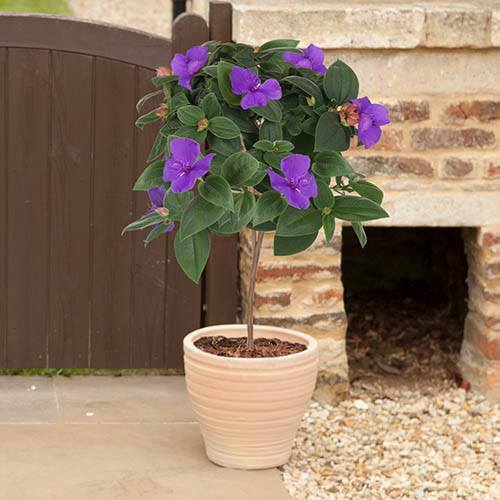 Forming a soft clump of downy foliage on top of a standard stem, the Glory Bush, Tibouchina urvilleana, is ideal for a patio pot in a sunny location or for a cool, bright conservatory. In late-spring, the most delightful, brightest azure-blue to deep-purple blooms smother the whole plant, lasting throughout summer in a wonderfully exotic display - it's not uncommon for the blooms to obscure the deeply veined, furry foliage, there are that many. Sent as an established plant in standard form, 75cm tall including its 3L pot. Grow in a good quality, loam-based compost in full light but keep shaded from hot sun. Water freely in summer but keep just moist in winter - allow compost to dry out between watering.